The Design Thinking Process was introduced and used by the teachers of CBC Monkstown in a CPD day organised by The Learning Revolution. The Design Thinking Process is a methodology created by David Kelley (IDEO) in Stanford University and is used by Industry to foster creativity and innovation . The purpose of the day was to use the Design Process to look at ways in which we could apply this process into the Education system. The core purpose of this was to look at ways to enhance our own learning environment and spaces. This was an alternative method of brainstorming ideas. It focused on small groups collaborating to come up with solutions to specific areas that were agreed by the teachers. These are a selection of images from our fab CPD on Design thinking held recently and facilitated by esteemed facilitators Professor Suzi Jarvis and Dr. Colman Farrell from the Innovation Academy in U.C.D. 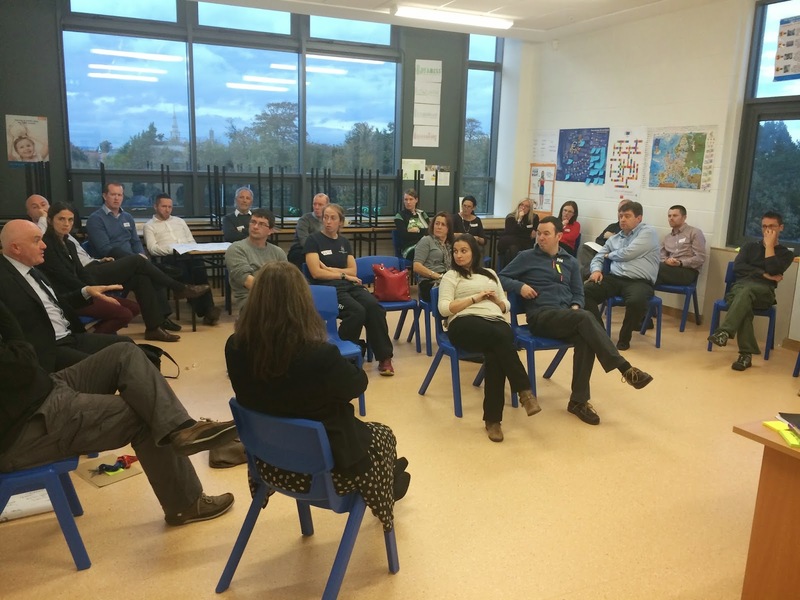 The day was a great success and the staff have subsequently been implementing the changes discussed into the school. History and Geography teacher Mr. Stephen O'Brien and two of his second year students Orson O'Sullivan and Gareth Hughes who made a great presentation to the Learning Revolution last Friday on their Cross-Curricular project using the Caravel ship. The project involved History, Geography and Technical Graphics and was a great success! Thanks to all involved for the great work done! The second year group 2 ASM completed a cross curricular lesson exercise that encompassed history, geography and technical graphics. The project was based on the Caravel ship, used in the 15th century during the Age of Exploration. The first aspect of the exercise was Mr Murnane’s transition year students designing a Caravel during their graphics class, which culminated in them supplying a step by step guide to the design process, which was put together in a 3 minute presentation, and a number of stills. The work produced was to the highest order and a credit to the class. Once the Caravel was designed the class was planned, the start of which was the students being given a brief overview of what was to happen, they were assigned some research and to come up with some questions. On the day the class went to the graphics room, and Mr Corcoran started us off with a talk on his crossing of the Atlantic, the presentation consisted of a PowerPoint presentation and talk, with the students taking notes. After the talk there was an opportunity for questions and answers. Mr Murnane then proceeded to give the students some background on the design of the Caravel and some excellent historical background to the ship. Mr Murnane focussed his presentation on the mast and the difficulties of the day in acquiring and placing it, with the actual tool used to smooth it, which again heightened the students interest. The class then attempted to design a mast and sail on the computers, which while they found difficult, they successfully completed the task in the main. This section of the exercise was the first time many of the students had experienced graphics and was a key tool of the cross curricular in pulling together their various learning skills. The following class was devoted to group work were we brought the various aspects of the class together on the whiteboard, and the students agreed upon the structure for their reports. The reports consisted of the students tracing the Caravel, which was a still supplied by Mr Murnane, and labelling it, and a section on Mr Corcoran’s talk, the Caravel and finally a paragraph on what they taught were the benefits of the class. The reports handed back were of an excellent standard, and the students really enjoyed and benefitted from the exercise. The students were able to put into context the difficulties experienced crossing the Atlantic by Mr Corcoran and they showed a better understanding of what the actual experience of crossing in a Caravel would have been like. The design section gave them a concept of the design process and an experience into the subject of graphics. They managed to relate all of their learning to the caravel and into an historical context, with a lot of geography used as well. Two of the students presented their finished reports to the Learning Revolution, at lunch on Friday, and all teachers present were highly impressed with the finished reports. The students reported that they enjoyed the experience, of using different subjects to learn and found the various learning methods helpful. There were some very interesting outcomes from the exercise, firstly the students were clearly invigorated and drawn into the learning experience. They also reported that the different learning methods were enjoyable, with the cross curricular, and three different teachers involvement extremely interesting and giving a greater learning experience. Secondly, while looking at the finished reports, they were a number of students that preformed far better than they usually would on tests, with one in particular standing out as excellent, which highlighted that the different approach to teaching and learning can really benefit some students. I would like to thank Mr Murnane for putting so much work and effort into the exercise, and his transition year group for the excellent work that they done, which can and will be used as a resource in the future. I would also like to thank Mr Corcoran for the time and effort he put into the presentation which the students found really enjoyable.